A backpacking trip that started 17 years ago now brings me full-circle... Today I find myself in the organised chaos of Kathmandu as all of my worldly belongings (now filling a more than a few backpacks) make their way over the Atlantic ocean and to my new home in Toronto. I start my journey in Kathmandu – my ‘home away from home,’ enjoying the unparalleled hospitality of the Sherpa family at their cosy bed & breakfast, ‘The Terrace’. The Terrace is an oasis of tranquillity moments away from the hustle and bustle of the touristy-hub of Thamel. With its beautifully decorated rooms, delicious breakfasts and steaming coffee, it’s an idyllic place to unwind, regroup, and reenergise before and after a trek or to use as a strategic outpost before venturing into the endlessly fascinating (but sometimes infuriating!) back streets of Kathmandu. Plus The Terrace is strategically located above the flagship Sherpa Adventure Gear shop so a great place to stock up on any kit that may have been forgotten...! I can’t help but be fascinated by the crazy city. I’m not sure what it is... Perhaps it’s because everyone and everything seems to ‘blend’ into the fabric of the streets, 'bonded' by the pollution and dust; a city where ‘everything goes’ (or doesn’t go at all). 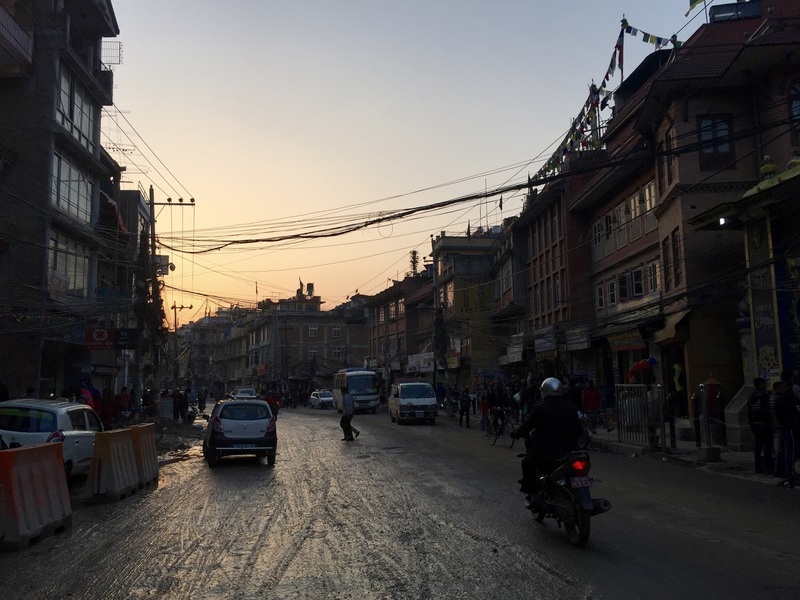 Haphazardly hung electrical wires, cracked buildings, bumper-to-bumper traffic, ramshackled rickshaws and pot-holed sidewalks serve as the backdrop for local merchants selling their wares – gurkha knives, Buddha statues, DVDs and rows and rows of outdoor gear and pashmina shops. And between these are the money changers, the booksellers, the trekking agents, rickshaw drivers, and the artists. And of course, the tourists. The background noise is relentless and overwhelming to the point where the noise becomes indiscernible. Honking horns blend with music echoing from the shops, friendly ‘Namaste’s, and the hypnotic chant of ‘Om mani padme hum’. An urban orchestra. Whilst in Kathmandu, I’ll celebrate the Holi Festival on 12 March. Holi is better known as the ‘festival of colour’ and based on what I've read about the celebrations in Kathmandu, it's a day of raucous celebration where the dusty brown streets of Kathmandu are brought to life through chaotic clouds of colour and singing and dancing. The festival marks the start of spring and the triumph of good over evil. The celebration consists of ‘playing’ Holi when revellers paint each other’s faces with brightly coloured red, yellow, purple, blue, orange or pink powder or by throwing colored water at each other from buckets and water balloons. It’s all in good fun – organised anarchy - and almost everyone walking along the street in Kathmandu on the day of the Holi Festival should consider themselves a moving target and run the risk of being a mobile colour chart for days or weeks after. Yikes..! After the Nepal earthquake in April 2015, I was introduced to the Chaudhary Foundation. The Foundation is the corporate social responsibility arm of the Chaudhary Group, Nepal's largest conglomerate. I’ve greatly enjoyed keeping in touch with the CF team over the past 1.5 years and have been inspired by their commitment to improving the health and wellbeing of Nepali people through initiatives in the social (education, health and sports); the economic (social business and enterprise initiatives); and finally the environmental sectors. 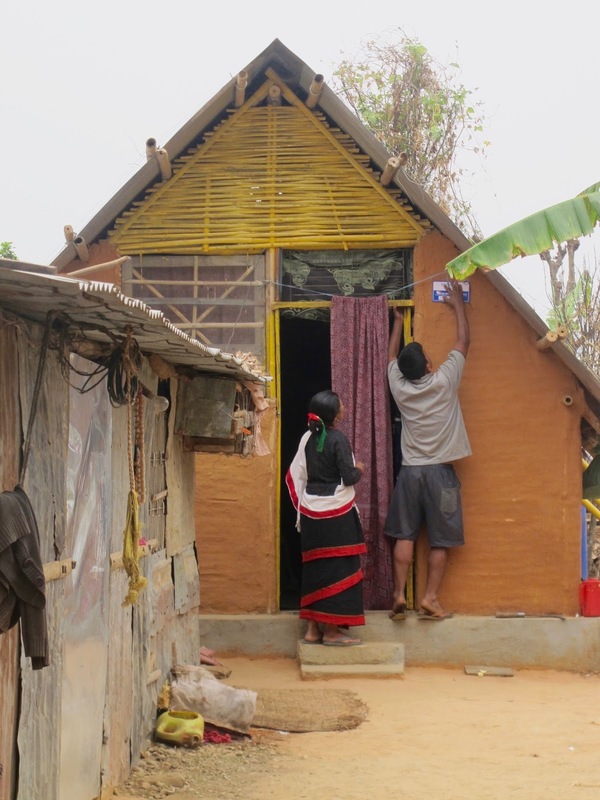 In October 2015 and in March 2016, I had the opportunity to see firsthand the Foundations successful 'temporary shelter' programme which provided thousands of shelters and hundreds of schools to those communities hardest hit by the earthquake. I look forward to spending a few days with the team learning more about their portfolio of initiatives being rolled out across the country. 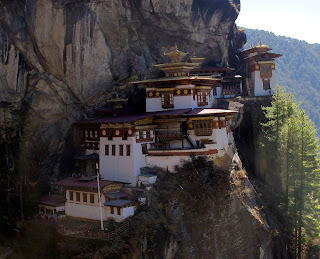 On 20 March I’ll travel to the Kingdom of Bhutan. There are images of places you see in books and magazines that capture your imagination, invoke curiosity and prompt wanderlust of epic proportions. Bhutan has always been one of these places for me since I first saw pictures of it in an old geography text book (pre-internet!). Closed to foreigners until the 1960s this little Kingdom has managed to preserve its rich cultural traditions and protect the diversity of its flora and fauna whilst carefully embracing global developments… I look forward in particular to seeing the mandatory national dress and, of course, the iconic Tigers Nest monastery perched precariously in a cliff face high above the small city of Paro. The next chapter of the journey will take me back to Nepal into the Khumbu of the Himalaya. From a personal perspective, the journey is a poignant one as it’s my first time back since visiting the ‘Everest region’ immediately following the 2015 earthquake. I look forward to revisiting the many families the people met along the way on that emotional 2015 journey – particularly the villages toward Namche and in Thame. When I left in 2015, I remember seeing the resilience and resourcefulness of the local people as they started rebuilding their homes mere days after the quake. I can’t wait to see how this resilience has manifested itself in the new homes, guesthouses, shops and schools which again line the well-trodden trail. I’ll continue my trek deeper into the Khumbu retracing steps towards Ama Dablam, Cholatse and Everest – stopping at the base of Lobuche Peak to step into my crampons, big boots and don my helmet to climb the 6100m peak. I must admit, I’m absolutely itching with excitement at climbing in the Himalayas again after a 2-year ‘pause’ to focus on my job and also regain some of the confidence and focus lost when the earth moved in 2015. Regaining confidence and focus has been a journey in itself and I’ve learned more then I ever imagined possible – about resilience, resourcefulness, and respect for our living planet. I’ll be literally ‘soaking up’ the Himalayan panorama with newfound joy and excitement. I’ve earned this! And finally, what will no doubt be the biggest adventure of all – my new home in Toronto…! I can’t wait to join PwC and their Consulting arm in Toronto, picking up where I left off in London. It’s been a long time since I called Canada ‘home.’ As this new chapter begins I am filled with gratitude for the many people who have been part of the journey thus far... Some of these people have inspired me with their genius and art. Others have shared with me insights about how I can live. Others have devoted their life to helping others. Some have conquered mountains while others have built business empires. Some are great artists while others have entertained with their brilliant musical talents. One thing that they all have in common is that they are passionate, talented, and amazing people who have added colour to my life and have helped to gently shape the moments that make up the journey – both at work and at play.